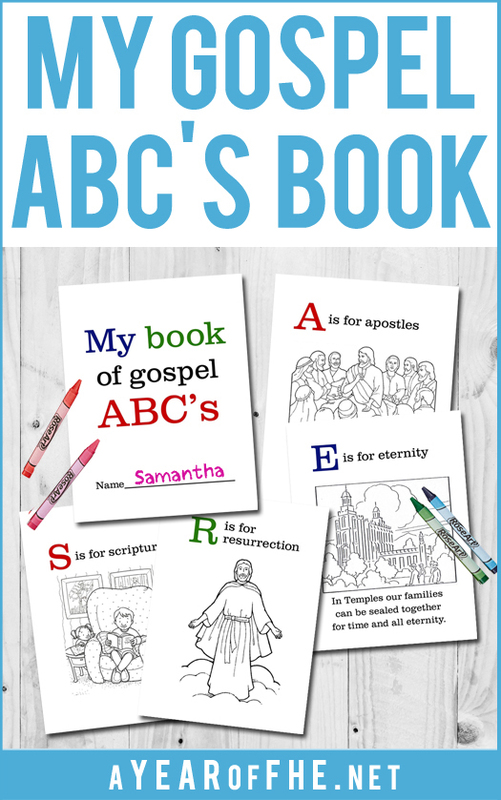 What You'll Need: scriptures, GAK 608/GAB 116: Christ and Children from around the World, GAK 225: The Last Supper, GAK 316: Jesus Teaching in the Western Hemisphere, Sacrament Rules Poster, Sacrament Coloring page, coloring tools. 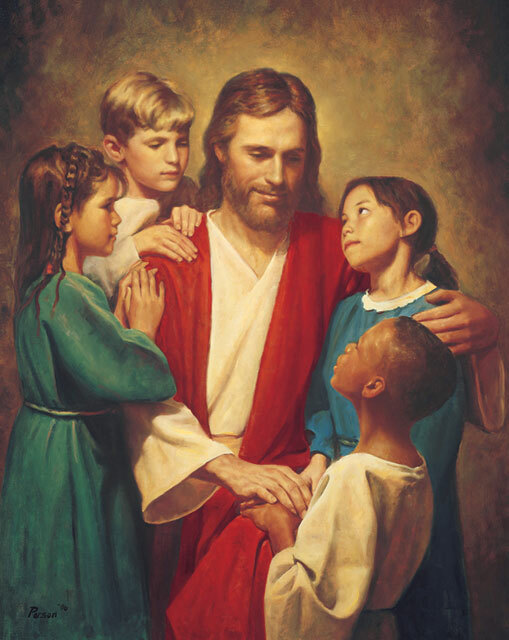 Scripture: 3 Nephi 18:10 - Blessed are ye for this thing which ye have done, for this is fulfilling my commandments, and this doth witness unto the Father that ye are willing to do that which I have commanded you. Jesus is the son of Heavenly Father. Because Jesus loves us so much, he came to earth to be our Savior. He healed the sick, taught the gospel, and showed the right way to live. He suffered for our sins so we could repent and live with Heavenly Father again. Before Jesus died he gathered his Apostles around him. Jesus gave them the very first sacrament at this time. He blessed bread and gave it to the Apostles, telling them to eat in remembrance of His body. Then He passed the cup, telling them to drink and saying that this was in remembrance of His blood. 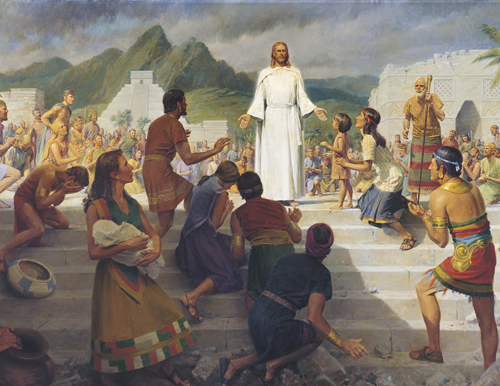 After his death and resurrection Jesus visited the Nephites on the American Continent. Jesus taught the Nephites about the sacrament. He talks about using bread and wine, but today we use water instead of the juice they called wine in those days. In 3 Nephi 18: 3-4, 7 it says, "And when the disciples had come with bread and wine, he took of the bread and brake and blessed it; and he gave unto the disciples and commanded that they should eat. And when they had eaten and were filled, he commanded that they should give unto the multitude. And this shall ye do in remembrance of my body, which I have shown unto you. And it shall be a testimony unto the Father that ye do always remember me. And if ye do always remember me ye shall have my Spirit to be with you." So the Jesus said a prayer over the bread, gave it to the church members there and asked them to eat it and remember his body. 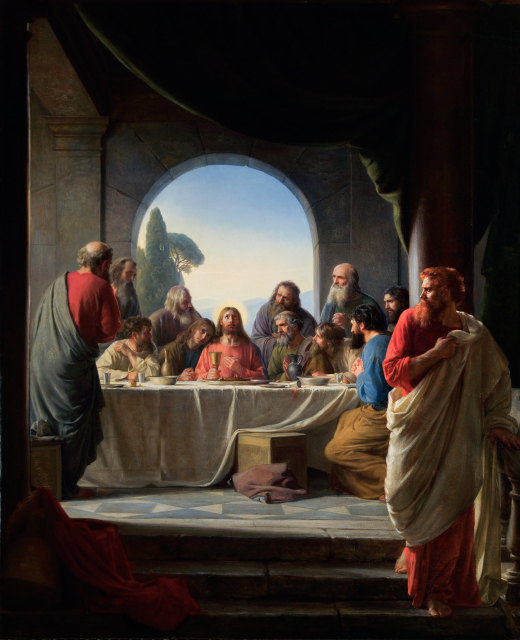 The story continues in 3 Nephi 18: 8-9 where it says "And it came to pass that when he said these words, he commanded his disciples that they should take of the wine (or water) of the cup and drink of it, and that they should also give unto the multitude that they might drink of it. And it came to pass that they did so, and did drink of it and were filled; and they gave unto the multitude, and they did drink, and they were filled." After the bread Jesus said a prayer over the water, gave it to the church members there and asked them to eat it and remember his blood. - Whom were the Apostles supposed to think of when they took the sacrament? - Whom were the Nephites supposed to think of when they took the sacrament? - Whom should we think of when we take the sacrament? 1. We get ready for the sacrament by singing a reverent hymn that reminds us of Jesus. 2. We listen carefully as the prayer to bless the bread is said. 3. When the bread is passed to us, we take only one piece. 4. We listen carefully as the prayer to bless the water is said. 5. We reverently drink the water and put the cup back in the tray. 6. 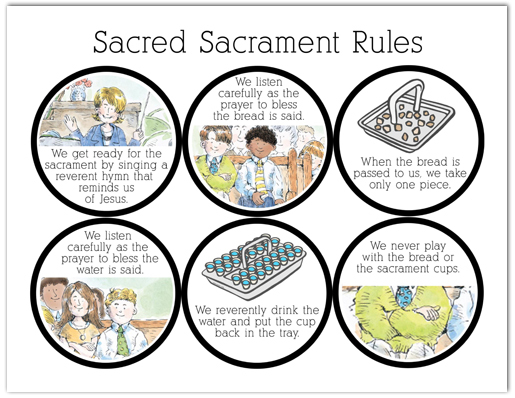 We never play with the bread or the sacrament cups. 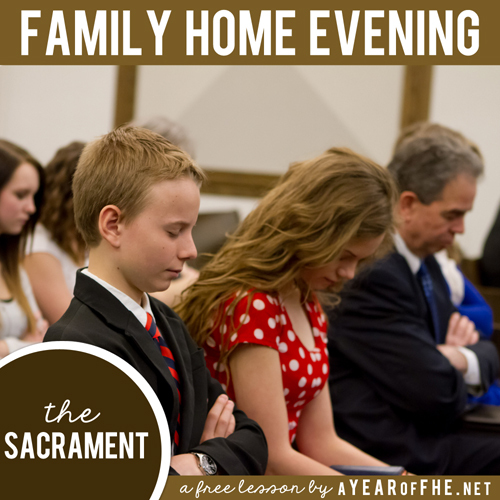 Bear your testimony about how grateful you are to have the sacrament to help us remember Jesus Christ and what he has done for us. Explain that you are especially grateful when everyone is reverent during the sacrament so you can concentrate on thinking about Jesus. (NOTE: These are NOT included in the leson download. You must download them seperately). - download Gospel ABC's book here. Print and prepare for next Sacrament Mtg. 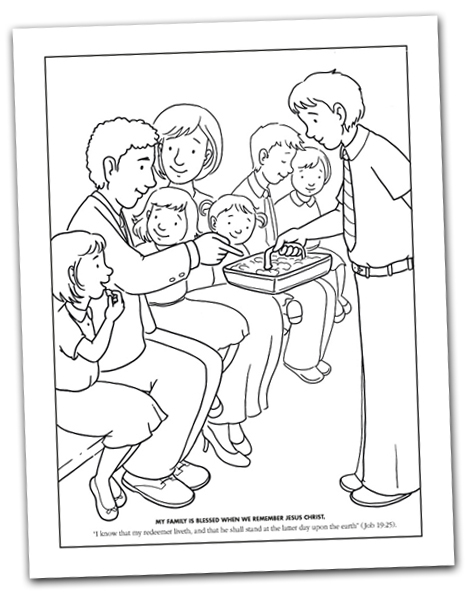 - download a few LDS coloring pages from this list. 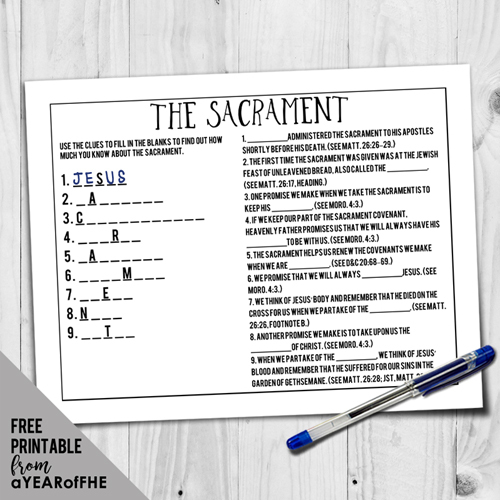 Print and staple along left edge to make coloring book for Sacrament Mtg. FAMILY HOME EVENING // "The Living Christ"
I love the link to the Gospel ABC book! I love that the kids can color these. I'm always looking for church centered activities for my kids to do during sacrament. Thank you! I really like that there are different parts to the lesson...the GAK, discussion and the finger play/poem. I think it will help my family to keep interested. Thanks! The sacrament rules and poem where a huge hit with our 2 and 3 year old- thanks for doing this every week! This lesson worked well for our family. It was perfect for our 1 and 4 year old. I think it will also expand well as the kids get older. Thanks! Using this one tonight! Thank you! I really like that you fully incorporated the Gospel Art Kit. It is so helpful with toddlers and preschoolers to have a visual. And the rules are awesome! My 3-year old is already excited about FHE tonight. Just got on this sight and I think I love you. Thanks sooooo much!!!! Wow, just found your blog. Printed this lesson for last nights FHE. It went great. My four year old listened so well and enjoyed it. Thank you so much. This will be my new favorite site. I love that this lesson is simple enough for my LITTLE ones to understand-most lessons seem to be geared towards those who can understand all about batismal covenants. This lesson was just perfect for my 3 year old. We put the Sacrament poster on the fridge and this morning, she explained the whole thing to Daddy who was at work last night and wasn't able to participate with us. Thanks so much!!! I love your website! I connect my iPad to the TV and it is all just laid out for me pictures and all. You make having FHE so easy. Thank you. This lesson will be perfect as my 4 and 2 year old are all over the place during the sacrament. I just found you via pinterest! I especially love the easy way to print the lesson!! Thank you very much! LDStrong is always looking for a blog, website, or pictures to share on FB and Twitter. We came across this blog and loved it. Today, LDStrong will feature your blog and share this FHE Lesson. Thanks for being awesome! Thank you! I love the sacrament rules! Thank you so much for this lesson. It got to be Monday night and we hadn't prepared a lesson yet - oops! I asked my 4 year old what he wanted to learn about and he said the sacrament. We were able to quickly pull up your lesson and have a nicely pulled together lesson instead of just winging it. Thank you thank you thank you! Thank you so much for the Lesson. I look forward to doing it with my family! This is such a helpful resource-can't wait to use it. I plan on visiting this site regularly. Thank you so much for your ideas and help! It makes a huge difference in my life. Thanks for the lesson! It is a huge help to me. Thanks for your talents! I love that I can use this with my younger son! I have used several of your FHE lessons and I love them! They are perfect for my two young daughters. Thank you for sharing your ideas and hard work. It truly is appreciated. I would really like to use your lesson for my FHE tonight but when I click on your links it says: "there is no preview"
This helped me so much with one of the Activity Day Faith in God requirements for my girls! Thank you! We are just starting FHE in our home and your site is very helpful for this newbie. Thank you!!! I left a comment on another post, but I just wanted to say thank you again for sharing these wonderful resources. I'm putting together a FHE packet focusing on the Sabbath Day and your lessons have been invaluable! I love the focus on the doctrine and the spirit that they have. Thank you, thank you! Putting these lessons together can be quite time consuming and challenging. Thank you for helping the rest of us. I am using your sacrament lesson. It is so good to get back to basics at times. I love your blog! I love that your lessons focus on the doctrine! Thanks so much! I love the setup of the lesson. You have a pdf to print out that I can follow along. The pictures are all chosen from the gospel art kit. The 2 handouts are excellent resources. Don't know where you found them--they're great! Best of all--it's FREE. Thank-you, thank-you, thank-you. Thank you so much for this beautiful lesson. I am really trying to make FHE as interesting and prepared as possible for my 3 little boys and this is exactly the right inspiration I need. THANKS AGAIN. I love this lesson! It was shared on FB as a sharing time 'go to' to help fill in a little more time. It's perfect!! It goes right along with the lesson but in a little more vamped up way. I love the story-type of lesson that it is. Pictures + gospel principles. THANK YOU! !